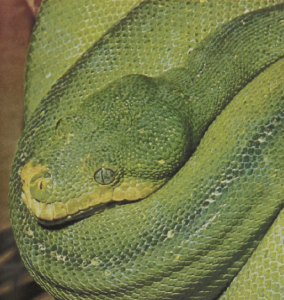 This tree python, about 5 feet in length, is found only in New Guinea, and only a herpetologist can tell it apart from the Emerald TreeSoa with which it has no connection. One differentiating characteristic is that the temperature-sensitive pits in this python are positioned in the center of each lip scale rather than between scales. Both species are obviously adapted for life in trees, and consequently one sees extreme parallelism in the coloration, in the way the animals drape themselves over branches when resting, and even in the appearance and reddish color of the juveniles. Since the ancestral forms in each case were quite different, this phenomenon is called “convergence” by biologists.